All seemed to have been failing for the Stony Brook men’s lacrosse team, as it trailed 11-6 heading into the final period of play on Saturday in its 11-9 season-opening defeat against the Sacred Heart Pioneers at Kenneth P. LaValle Stadium. The Seawolves were outshot 38-22 going into the fourth period. The team’s offense seemed to have gone flat, producing 12 total shots in the previous two periods. Faceoff defeats were also an issue, as the Pioneers won all six second-period draws and outmatched the Seawolves 3-1 in the third period. In the fourth period, however, things turned around for Stony Brook. “We played much stronger in the second half and showed some resilience, but we are a young team and these early-season challenges are going to make us stronger,” head coach Jim Nagle said in a press release. Sophomore attackman Tom Haun fired a shot a few yards away from the Pioneers’ goal, which reached the back of the net just over a minute into the period. Haun’s goal closed the Pioneers lead to 11-7, but his contribution to the comeback wasn’t quite finished. The 5-foot-10-inch attackman notched his second goal of the period 2:16 after his previous one, bringing Stony Brook within three goals with 10:57 left in regulation. Haun finished the game with a hat-trick, leading the Seawolves in goals. The Seawolves’ offense found its rhythm throughout the period, racking up numerous opportunities, including a shot from junior long-stick middie Ryland Rees, which was saved by Pioneers sophomore goalkeeper Brooks Dutton with about nine minutes left. Following Rees’ opportunity, sophomore midfielder Chris Pickel Jr. was able to sneak the ball past the Sacred Heart goalkeeper with help from sophomore attackman Cory Vanginhoven. This goal brought the score to 11-9. The Pioneers called a timeout following the goal to try and slow the Seawolves’ momentum. Stony Brook maintained pressure with numerous opportunities, yet none found the net. Time eventually expired on the team’s comeback, sealing the Sacred Heart victory. 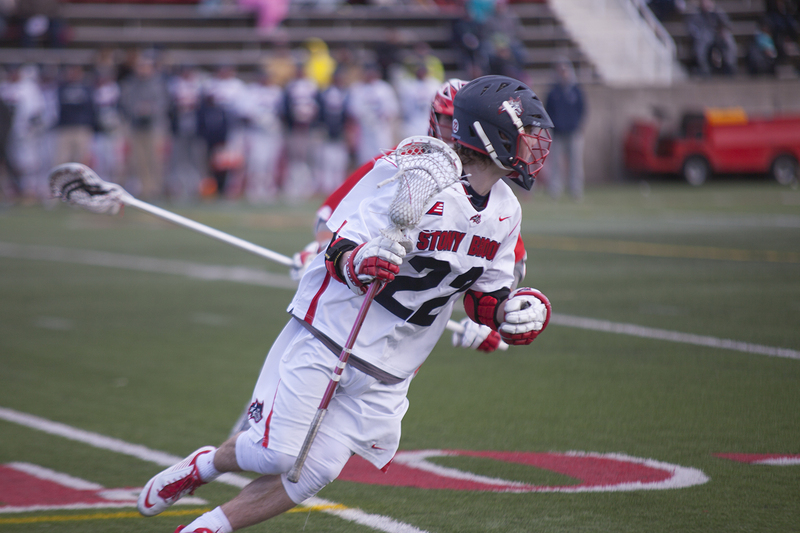 Junior midfielder Owen Daly was the second Seawolf to have a multi-goal showing this season. Daly’s two goals matched his total for the entire 2016-17 season. The Seawolves defense was unable to shut down the Pioneers rush during parts of the matchup. Stony Brook allowed 24 shots and nine goals in the first half alone. “We definitely didn’t respond defensively today, and we had a great preseason defensively,” Nagle said. Freshman goalkeeper Ryan Erler stopped a total of 13 shots out of the 24 posed on goal in his collegiate debut, including 10 saves in his first 30 minutes of play. Erler previously played at Smithtown High School West, where he finished his senior season with a .750 save percentage. Both teams finished the first period of play at the same pace, each accounting for 10 shots. The Pioneers had a slight advantage as they rallied for one more shot on goal with seven to the Seawolves’, six going into the second period. Turnovers were a vital problem for Stony Brook in the earlier portion of the matchup. The team turned the ball over a total of nine times in the first half, three times as much as Sacred Heart. Despite the loss, Nagle is still confident in his team’s ability to work as a unit and compete through the rest of the season. “I’m very confident with the leadership and togetherness on this team,” Nagle said. Stony Brook will travel to central Pennsylvania for its next game on Saturday, Feb. 17 to take on the Penn State Nittany Lions at 2 p.m.